Tri-linear scanning equipment, whether flatbed scanners (Kodak, CreoScitex Eversmart, Dainippon Screen Picasso, Umax, Microtec or Epson) or digital cameras (BetterLight, Kigamo, Anagramm, Phase One) all benefit from having a power line conditioner equipment. If an elevator motor, any pump, even a laser printer, is turned on anywhere in your building, this results in a minute dip in the lights in your studio. This diminution may not be visible to your eyes, but the sensor in most tri-linear scanners or digital cameras notices the change in power and puts a dark gray line across your image. FLAAR has had Sola/Hevi-Duty MCR portable power line conditioners on duty for about ten years and not one has failed so far. 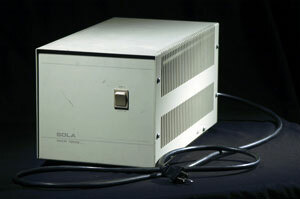 The 1000-watt portable MCR Sola/Hevi-Duty units are the ones we use most often, though it would be nice also to have at least one 1500 watt and one 2000 watt MCR unit. 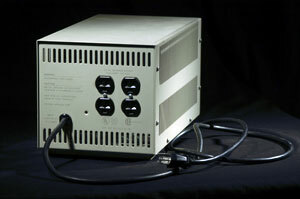 Sola/Hevi-Duty also offers MCR model power line conditioning with voltage regulation. 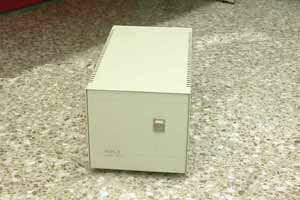 These also have surge suppression, etc.